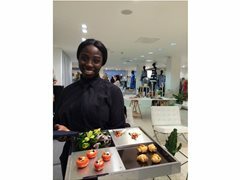 The Hospitality Company is one of the UK's leading VIP events staffing agencies. We are able to provide flexible part time work in a variety of different roles including waiting staff, bar staff, supervisors and baristas. We are a young company dedicated to being at the front of London's biggest events whilst simultaneously offering our staff the opportunity to join a fun, outgoing and hard working team that are constantly working in new environments at exciting venues. Pick and Choose WHEN, WHERE and HOW MUCH YOU WORK!